The student visa invitation letter is an official invitation document. It explains your purpose of visit to Russia as an international student. The letter is prepared in Russia at the Federal Migration Service office and usually takes 30-35 days. Since May, 2015 we provide our international students with electronic invitation letters, which are sent by e-mail. Student visa invitation letter has your personal details, purpose of your visit and your duration to stay in Russia (initially for 90 days). After you get your invitation letter, you need to turn to the nearest Embassy or Consulate of the Russian Federation in your country for applying for a Russian student visa. You have to bring your international passport and the printed invitation letter with you. The first visa will be available for 90 days only. After your study visa is successfully received, you should learn what information you can see in it. You have to come to the town of Ukhta (the Komi Republic) in the period appointed by International Department. In case of late arrival the extension of your visa will be impossible (visa extension must be made not less than 35 day before its expiry date). This involves that you have to leave the territory of the Russian Federation after your visa is expired. What is a Migration Card? According to the Russian law, each foreigner entering the territory of the Russian Federation should register his or her visa within 72 hours upon arrival, except for weekends and official state holidays. 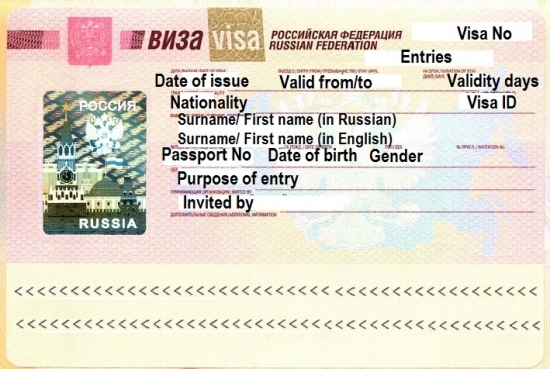 Failure to register a visa may lead to detention by the Russian police, fines and other inconveniences. To register the visa, one needs a migration card (see picture). 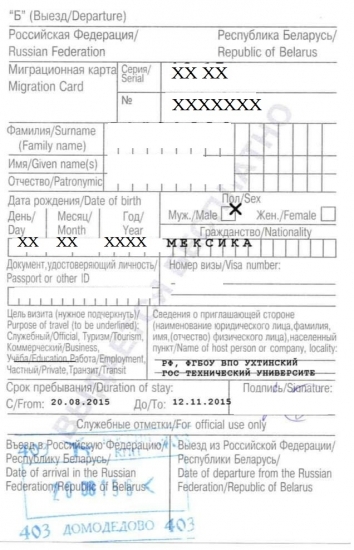 The migration card should be filled out by every foreigner entering Russia. It consists of two sections. The top part of the card is collected by the passport/visa control officials, while the bottom part is collected when the person leaves the country to return home. Migration cards serve as a statistical tool and a record of entry, exit, and registration. The card is also necessary to register at place of living (dormitory, hotel, apartment etc.). Migration cards are available at all ports of entry from Russian immigration officials (Border Guards). Every time one enters Russia, he or she needs a new card. Please remember that you can not stay longer on the territory of the Russian Federation than it is stated in the migration card. In Russia it is an obligatory procedure. All foreign guests in Russia should be registered in the International Register of Federal Migration Service. The purpose of the registration is to notify the immigration authorities about the place of your stay while you're in Russia. You would think that the Migration Card, which you fill in on the plane before you come to Russia would suffice, but no, the registration is a totally different thing and should be done separately. Please keep carefully, don’t loose or throw away your Migration card, it is a very important document that is needed for registration. Please keep it carefully in your passport. If you’ll unfortunately lose it, you should apply for duplicate to migration authorities. It is necessary to get a stamp on the clean side of it that proves official registration in Russia. 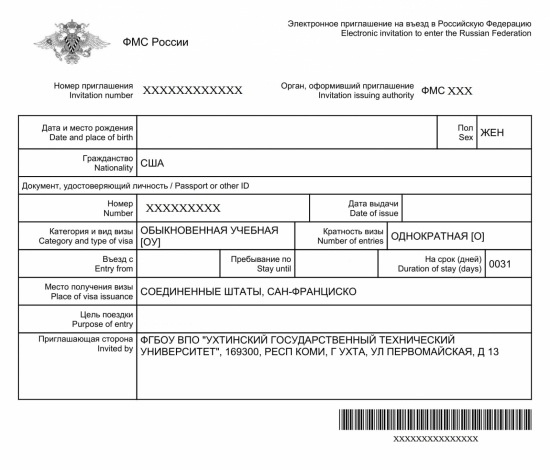 One more confirmation of the official registration in Russia is a stamp on the registration form. Officially, it's not your obligation to register your visa, it should be done by the accommodating side. However, if you don't register your visa, you may be fined as well as deported (although the latter is very unlikely) and denied from entering Russia again (maximum 5 years). Where and How to Register Your Russian Visa? If you are staying in a hotel, the hotel must register your visa (according to the Federal Law № 115-FZ, article 24). The hotel administration will ask you for your Russian visa, passport, and migration card (which was given to you at the Russian border). A small registration fee can be imposed and normally it takes from a few minutes to a day to have your visa registered. If you're staying in the USTU hostel, you should come to International Department (Ukhta, Pervomayskaya street 13, main building, room 321/1 "A") in the nearest suitable time for you. Please bring your passport, migration card and tickets to Ukhta. You or your hosts simply leave there a passport and migration card for 1-3 days and then get it back with necessary stamps. If you're staying with friends or renting an apartment: according to the new rules any Russian citizen with "propiska" (registration) can register a foreigner at his/her apartment at a local Administration of Federal Migration service or central post office. If you live in the family of USTU staff please tell your hosts to contact International Department: Ukhta, Pervomayskaya street 13, building "A", room 321/1. It is necessary to make a “double registration” - registration from the side of hosts and official organization (the university). Your hosts may also get a consultation about the required documents by phone: +7 8216 774-556. What if You Don't Register Your Visa? If you don't register your visa, you might have problems with the police (if they stop you to check your passport). The fines that you might pay (about $100 US) and the procedure of making protocol are really unpleasant. In the worst case, you may even be deported from Russia. If you were deported, you wouldn't been able to enter Russia for 5 years after the deportation. So, we strongly recommend you to register your visa in 72 hours (only working days count) upon arrival. 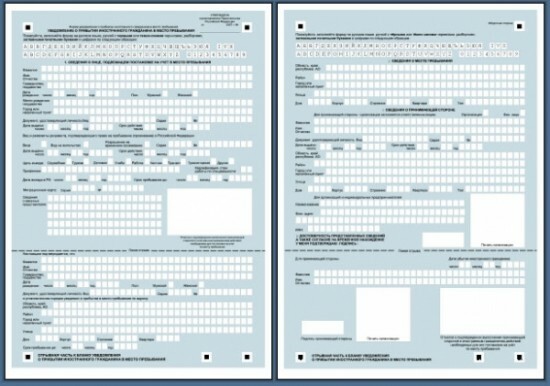 In order to escape any problems with registration, please contact International Department, we’ll help to solve them. Also, one important thing to know is that because it's the responsibility of the accommodating side to register your visa, they will get in even more trouble than you would because of not registering your visa. If it's a hotel, they won't only be fined, but may lose their license. If it's a host, they will be fined too and in case you're renting an apartment they might also be prosecuted for tax evasion or something like this. So it's in their interests to register your visa and avoid any problems with authorities. As a result of successful registration you’ll get a stamp on the back of your migration card with dates of the period of your registration in Russia and a cutting part of your registration form also with the same stamp. These two papers will be checked on the border of Russia. Please keep your migration card and a special piece of paper with a stamp that confirms your registration has been submitted.